Beards are a modern male trend, visible on many celebrities and fashion icons today. When growing a beard, there’s often the temptation to allow it to be wild, like when growing one’s hair out. In order to make beards continue to be fashionable, but still workplace viable, more attention must be spent on maintenance. Proper beard care requires effort, time, and product. Products range from beard oil, beard lotion, beard tools, and beard wash. A well-groomed beard is a great reflection of personality, and great beards often get a lot of attention. Check out beard show competitions to view some beards with extreme personalities! •	Keep the beard moisturized and clean Keeping one’s beard clean and moisturized will prevent itchiness and promote a soft texture. If a person doesn’t condition his beard after washing, it will most likely become wiry and dry. This causes the itchiness that often leads to shaving during the growing out process. Many experts suggest the use of a beard wash and a conditioner. However, if this fails to work, one can try a good beard balm. This will add moisture to the beard throughout the day. •	Maintain a workable routine Proper beard grooming requires time. This means one must commit to spending a certain amount of dedication and money on beard maintenance. Product use, shaping, edging, and trimming should take place on a daily basis, which often leads to a similar time investment when compared to shaving. If the idea of growing a beard is enticing from a notion of less stress, one should reconsider it. If a routine works for you, then grow it out! •	Invest in the right beard tools It’s an important investment to purchase the correct tools for keeping a beard that looks sharp all the time. Such tools include a beard trimmer, a pair of professional scissors, and a beard comb. It’s also important to keep in mind that the tools one needs depend on the length of the beard that the person wants to grow. Plastic combs may handle shorter beards well, but wooden beard combs are essential for longer beards, especially when coupled with a product like balm. Multipurpose tools come in handy also. For instance, a wide-toothed comb is ideal for a beard, while a fine-toothed comb is more suitable for a mustache so it’s best to purchase a comb with both edges. •	Learn how to trim a beard A good beard trimmer plays a very crucial role when it comes to sculpting, however, it must be handled properly. Some helpful tips are, before trimming a beard, comb it in a downward motion. While trimming, move upward and outward, especially around the sideburn area. Traditionally, it is more stylish and clean to have the cheek sections run shorter near the sideburns and longer as one approaches the goatee (chin and mustache). This prevents beard puff and improves facial structure. It’s also important to note that a beard should not be trimmed when wet, since this often leads to cutting off more than intended when using a guard. •	Invest in the right beard products Many men complain about itchy beard when trying to let it grow. Without proper product, beards absorb their nutrients from the face leaving it flaky and dry, which may even lead to dandruff. Products like mustache wax, beard oil, and beard balm hydrate while providing important nutrients. Proper beard product also keeps the growing beard styled slick and tidy. BeardGains.com has the mission to provide every resource needed for proper beard maintenance. 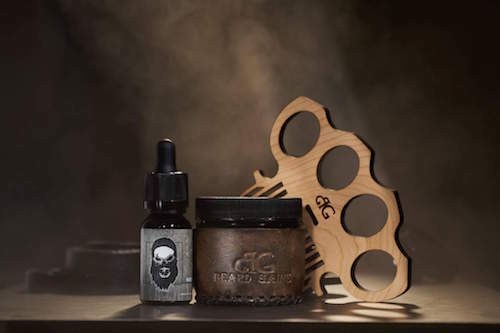 From grooming tools, to oils and balm, to vitamins, the website’s focus is to help every man with any beard style to be well groomed and well taken care of. The website strives to have a wide variety of wood combs that cater to a diverse subject matter in terms of look; lending flair to what defines you. They strive to make all products affordable, their purchasing easy, and their customization endless. One can request for an engraving or an image on combs and they will customize it accordingly.